Discussion in 'iPad General Discussions' started by NumbLock, Jul 10, 2010. 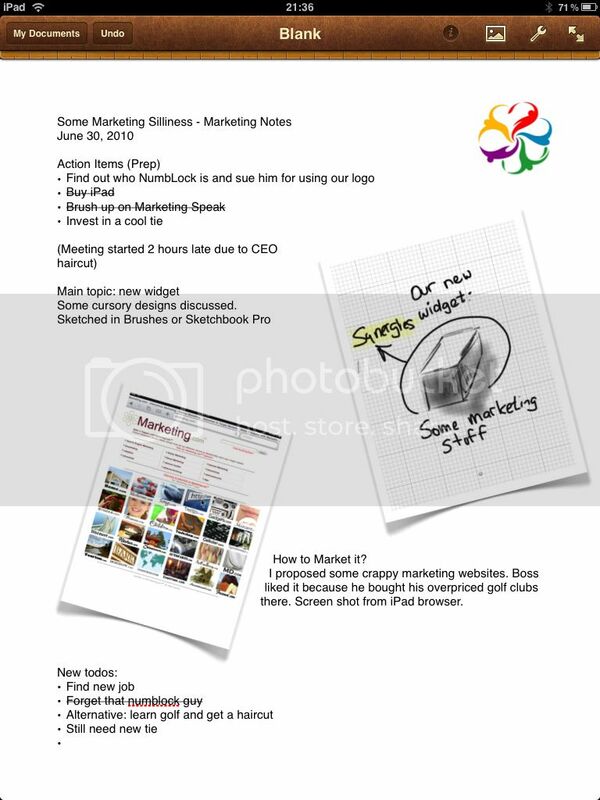 After trying out a ton of apps, I like the results and features of just using Pages (iWork) and SketchBook Pro the best. I'm thinking about giving Pages a try. Is there a way to use the iPad as digital voice recorder? Not that I know of, sorry. It wasn't really a feature that attracted me that much. Not a digital voice recorder but soundpaper seems to offer a mix of note taking and voice recording. Anyone use it? No, never hear of it before. I thought that the iPad would be a great incognito voice recorder though and could come in handy in certain situations. You should try "Penultimate" with a Pogo Pen really usefull. I finally decided on Paperdesk. I like that you can switch between text and freehand drawing easily in the same document. Its very similar to Journal on the TabletPC is you have ever used that.